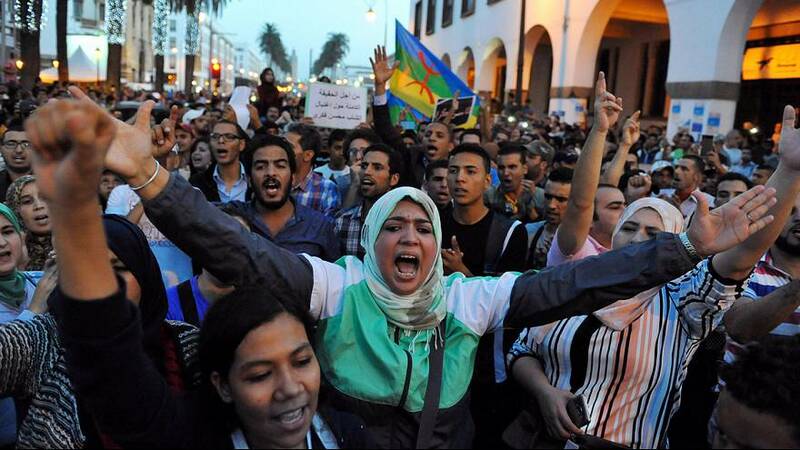 Thousands of Moroccans have taken to the streets for a fourth day of protest over the death of a fishmonger. Mouhcine Fikri was crushed to death in a garbage truck while trying to retrieve swordfish confiscated by police in Al Hoceima. It led to angry posts on social media prompting demos across several cities against police violence. Among the protesters who gathered outside the parliament in Rabat on Monday night, human rights activist and member of the Moroccan Association for Human Rights (AMDH), Taib Madmad said it wasn’t the first time. Some are drawing parallels with the death of a fruit seller in Tunisia which triggered revolts across the region, known as the Arab Spring in 2011. Mohamed Bouazizi set fire to himself after police confiscated his produce. It sparked wide-scale demos against social and political issues in the country and eventually led to leader Zine El Abidine Ben Ali stepping down after more than 20 years in power. Fikri had fish confiscated by police after buying it in the port of al Hoceima. Local authorities banned swordfish fishing and sales during this season. Local media reported that Fikri jumped into the garbage truck in an attempt to recover the catch and was crushed. Activists accused the police of ordering the garbage men to crush Fikri. Police denied the accusations in a statement released on Sunday. It comes at a sensitive time for the kingdom as it prepares to host the COP22 climate summit. King Mohammed VI, ordered the interior minister to visit the victim’s family and present royal condolences. The government has promised an investigation.